Early this morning, a Southwest patrol officer spotted a 2004 Black Hyundai traveling down Jefferson Blvd. This vehicle caught the officer’s attention because it matched the description of the vehicle used in several business robberies throughout Dallas. The officer followed the Hyundai into the Quick Trip gas station located at Zang Ave. and 12th Street. The officer observed the suspect, later identified as Gregory Lewis, a 25 year-old Black male, walk into the store and called for additional cover officers. As the officer waited in his police vehicle, he received confirmation that Mr. Lewis was indeed the suspect wanted for multiple aggravated robberies. Upon the arrival of his cover officers, Mr. Lewis was taken into custody without incident. Mr. Lewis was interviewed by Robbery Detectives and was then transported to Lew Sterrett Jail. Mr. Lewis had just finished serving 4 years within the Texas Department of Criminal Justice for aggravated robbery. Awesome work done by Southwest officers who were able to get a repeat felon off the streets. On July 13, 2018, the CRT and Deployment Units from North Central Patrol initiated a traffic stop on a suspect driving a black Chevrolet Camaro that detectives knew to be involved in multiple business burglaries in the North Central Division. The suspect, Shane Richards W/M/46, was placed under arrest for Displaying Wrong License Plate and transported to North Central Investigative Unit where he was interviewed by detectives. During the interview, Richards admitted to his involvement in six Business Burglary offenses, a Criminal Mischief, and a Theft of Property. The Dallas County DA Community Response Team will handle the prosecution of these cases. On March 9, 2018, Officer Weddle #10754 and Greene #10639 of the Northeast Patrol Division Crime Response Team began their shift at 8:00 P.M. During their shift, officers Weddle and Greene observed a red Chevy Tahoe in the 10051 block of Whitehurst Drive with a paper dealer tag. A registration check revealed the paper dealer license attached was not registered to the Tahoe. The officers initiated a traffic-stop, upon contact with the driver, the officers observed marijuana inside of the vehicle within plain view. The driver of the Tahoe, Dijon Roberts, a 23-year-old male was asked to exit the vehicle and was placed under arrest. While conducting an inventory search of the Tahoe, the officers found 30.1 grams of marijuana, 9.4 grams of crack cocaine, 17 grams of Alprazolam, 21.6 grams of suspected ecstasy, and 2.6 grams of suspected fentanyl. They also recovered two stolen handguns, two digital scales and an assortment of plastic baggies commonly used in the manufacturing and delivery of illegal narcotics. In addition, $1,697 in cash was seized from the arrestee. Officers Weddle and Greene utilized their work experience and knowledge while performing their patrol duties that lead to the removal of illegal drugs and firearms from the streets of Dallas making our community safer. Thank you for all you do and keep up the great work. On December 25,2017 at about 1:38 a.m., a call to 911 was made regarding a child abduction at the Racetrac gas station in the 8100 block of East R. L. Thornton Freeway. Information provided to officers stated that a white Chevy Malibu with two small children had been taken by a Black male and fled southbound along N. Jim Miller Road. Officer J. Villar #11199, Officer C. Alvarado #10420, Senior Corporal G. Ceraso #9415, Officer J. Ruiz #11141, and Senior Corporal J. Debevec #9672, responded to the call for service. During the investigation of incident, Officer J. Villar located the mother of the two small children and quickly began gathering further descriptive information of the vehicle and suspect, relaying both to fellow officers and dispatch over the police radio. Air 1 was requested to assist in locating the white Chevy Malibu containing the two small children that was driven by the suspect. Sergeant J. Scott #8765 worked with the Communications Division to get a better location of the vehicle. Air 1, being piloted by Senior Corporal L. Lespagnol #7874 and Senior Corporal L. Turano #9186, responded from the hangar to assist officers in the field with this investigation. Senior Corporal J. Debevec quickly notified Youth Operations of the child abduction and all information gathered up to that point, who in turn notified on-call Detective G. Harper #9668. Air 1 eventually located a white vehicle in the 1300 block of East Clarendon. The pilots determined that the vehicle observed was indeed the white Chevy Malibu taken in the offense, and relayed this information to officers in the field. Officers assigned to the South Central Patrol Division assisted the officers from the Southeast Division, and with a coordinated effort from Air 1, K-9 units, and Patrol elements from both Southeast Division and South Central Division, the suspect was apprehended and taken into custody. Both small children were located unharmed still inside the vehicle. Once both children were determined to be unharmed and evaluated by paramedics, they were reunited with their mother by officers. The suspect, mother of the children and the children were then transported to Jack Evans Police Headquarters to be interviewed by Detective G. Harper 9668 with Youth Operations. Upon completion of the interviews of all persons, the suspect, Calvert Johnson B/M/40, was transported to Dallas County Jail and charged with Unauthorized Use of a Motor Vehicle, two counts of Kidnapping, and Evading Arrest on case number 291604-2017. Because of the quick response and coordinated efforts of Southeast Patrol officers, South Central Patrol officers, K-9 Units and Air 1, the suspect was quickly located and the children were safely returned to their mother. The Dallas Police Department is proud of these officers for their quick thinking and hard work to bring a frightening situation to a peaceful end. Great work! The Central Patrol Division has been experiencing burglaries in the Uptown area. The subject committing the burglaries was using a mechanical drill to drill into door locks. Intelligence information was gathered and lead to a possible suspect. The Central Crime Response Team and Deployment Unit conducted surveillance on the suspect and the suspect evaded officers in a stolen vehicle that was taken in a burglary offense. Central officers care for the community they serve and it showed greatly with their actions. The offense was documented on case number 204227-2017. While you were sleeping, Dallas Police officers in the Central Patrol Division were hard at work capturing a suspect in a stolen vehicle and two other suspects who were breaking into vehicles. Last night, at about 9:00 p.m., a victim called police to report that her vehicle was stolen from the 2800 block of Cityplace West Boulevard. A few hours later, another Dallas Police officer spotted a vehicle driving in the 2400 block of N. Haskell Avenue without any headlights illuminated. The officer stopped the vehicle and discovered that it had recently been stolen from Cityplace West Boulevard. The juvenile suspect was transported to the Youth Division at Police Headquarters and the vehicle was returned to the victim. Later on, at about 3:00 a.m., officers working in a covert capacity spotted two suspicious individuals in the 700 block of N. Glasgow Drive. The suspects were walking down the street pulling on the door handles of parked cars. Officers watched as the suspects opened an unlocked vehicle and took property from inside the vehicle. Uniformed officers arrived and arrested the suspects for Burglary of a Motor Vehicle. The officers were also able to return the stolen property to the victim. These are just a couple of examples of the great work our officers are doing every day and night to keep our city safe. Thank you! On Friday, August 5, 2016 at approximately 6:00 p.m., the Northeast Division Deployment Unit was in the White Rock Lake area for a BMV (Burglary of a Motor Vehicle) initiative. The covert officers observed a known BMV suspect vehicle enter the parking lot in the 8000 block of E. Mockingbird Lane. The officers observed a Black male suspect exit the suspect vehicle, break the window of the victim’s vehicle, and remove property. The suspects then fled onto Mockingbird Lane, at which time the covert officers called for cover from uniformed officers and the Air 1 Helicopter. Uniformed elements tried to stop the suspect vehicle, but the vehicle evaded the officers. The officers spotted the suspects a short time later near North West Highway and Shady Brook. The suspects evaded from the officers again. Air 1 then followed the suspect vehicle all the way to Metropolitan and Colonial in South Dallas where the suspects exited the vehicle and fled on foot. Officers from the Northeast and Southeast Divisions apprehended the suspects a short time later. The officers found property of ten different victims in the suspect vehicle. All of the BMV offenses occurred on August 5, 2016 between 4 p.m. and 6 p.m. All of the victim’s were contacted and recovered their stolen property. The suspects have been identified as Osborne, Anthony B/M/32 and McMillan, Joshua B/M/22. They have been charged with Burglary of a Vehicle, Evading Arrest, and Fraudulent Use or Possession of Identifying Information. Thanks to the great work of the Northeast Deployment Unit, Northeast Patrol officers, Southeast Patrol officers, 2.0 officers, and Air 1 these suspects are off the street and the victims were able to recover their property. Excellent work! On June 30, 2016, the Dallas Police Department’s Crime Response Team (CRT) and Deployment officers answered a Burglary in Progress call at 6213 Melody Lane. As officers were approaching the offense location, the dispatcher broadcasted the suspect description over the police radio. Responding officers observed and individual matching the suspect’s description walking on Melody Lane and subsequently took him into custody. The suspect was identified as Matthew Paul Rounsaville (W/M/29). Rounsaville admitted to the offense and was charged with Burglary of a Habitation, which is documented on case number 158246-2016. 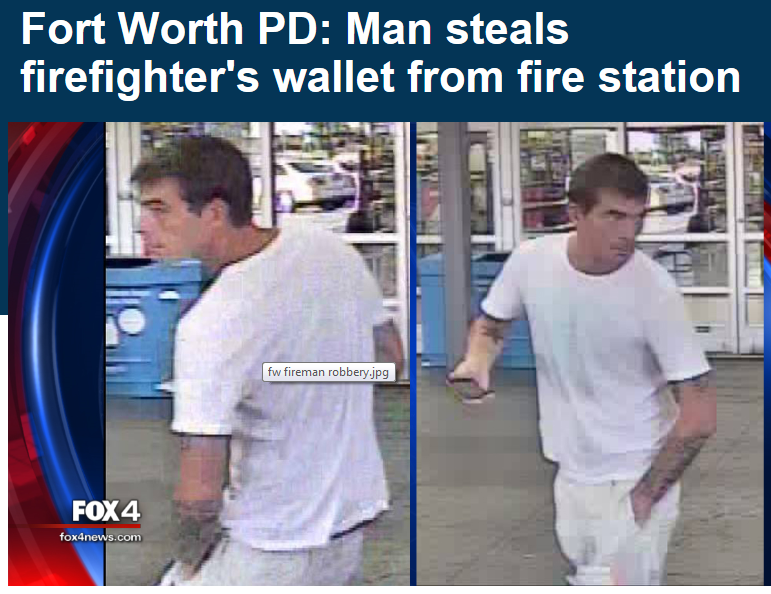 As a result of the arrest and upon further investigation, it was discovered that suspect Rounsaville was also responsible for a burglary at a Forth Worth fire station. Surveillance video from the offense in Fort Worth was featured on Fox 4 News. Suspect Rounsaville had stolen a fireman’s wallet and used his credit/debit cards at local businesses. With this arrest, Rounsaville will also be facing charges filed by Fort Worth PD. Thanks to the quick response and conspicuous initiative displayed by the Northeast CRT and Deployment Unit a habitual burglar was taken off the street…Job Well Done!!! On June 29th, Southwest Deployment officers along with the assistance of Denton County Sheriff’s Office (DCSO), were able to capture suspect Lonnie Brown, B/M/20, who had been on the run for various outstanding warrants. The 20 year old suspect fled the Dallas area and went to Oklahoma when he noticed he was wanted for questioning on an Aggravated Robbery that had occurred on Hampton Road in March of 2016. Detectives were contacted by a cooperating citizen and revealed that suspect Brown was back from Oklahoma and was staying in Lakewood Village, Texas. DPD and DCSO worked together to capture suspect Brown and transported him to Dallas Police’s Crime Against Persons Division for interview where he placed himself at the Aggravated Robbery offense that occurred in our Southwest Division. Suspect Brown was transported to Lew Sterrett Jail. Suspect Brown was also wanted for an additional Aggravated Robbery (072583-2016), a Burglary of a Motor Vehicle (041998-2016), Burglary of a Habitation (016328-2015), Probation Violation for Unauthorized Use of a Motor Vehicle (F15-56967U), and Probation Violation for Possession of Marijuana 4oz-5lbs (F15-54757U). Our Crime Against Persons Division will continue the investigation to determine if Suspect Brown will be charged with an additional Aggravated Robbery offense. On June 21, 2016 at approximately 2:00 p.m., plain clothes Dallas Police detectives observed suspicious activity involving four males sitting in a silver SUV in a shopping center parking lot located in the 2500 block of W. Northwest Highway. The officers observed two of the males exit the SUV and attack the victim who had just exited his vehicle. After striking the man several times, the suspects took a bank bag from the victim and got into their SUV and drove off. Detectives followed behind the suspect, and with the aid of marked police squad cars, the suspects were stopped a short distance away. All four suspects were taken into custody and brought to police headquarters to be interviewed by detectives with the Dallas Police Robbery Unit. The victim’s money was recovered and returned to him. This offense is documented on case number 150188-2016. This is still an ongoing investigation and detectives are trying to determine if these suspects are responsible for any other robberies of this type in the Metroplex. If you have any further information regarding this offense, please call Dallas Police Robbery Detectives at 214-671-3584 or Crime Stoppers at 1-877-373-TIPS (8477).